Once upon a time, in a forum not so far from here, there was a discussion. "What would you design into your own ultimate motherboard?" The discussion seemed to focus on putting together on an Athlon platform for affordability. 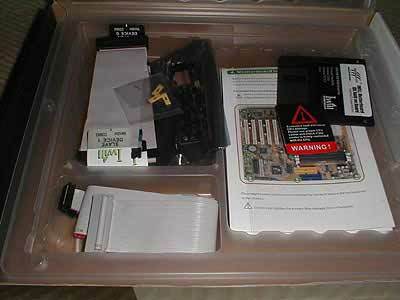 The fantasy board supported DDR, four IDE channels with two of which being courtesy of a third party chipset capable of RAID. 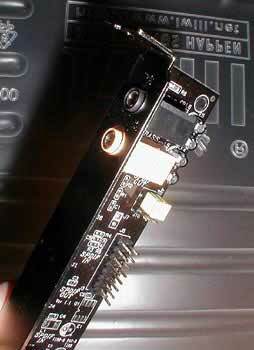 The board was imagined to have on board 5.1 sound that could support 6 channels. The discussion really started to take off when we started talking about what we would want in overclockability. Of course, all adjustments were to be made in the BIOS. The adjustments were to include not only the adjustment of front side bus, but also multiplier and voltage adjustment. Some even suggested an adjustable PCI divider so as the front side bus went up; the PCI could be adjusted down. I think Iwill read our discussion! When our discussion was underway nearly half of a year ago, there was no PC2700 and ATA133 was unheard of. 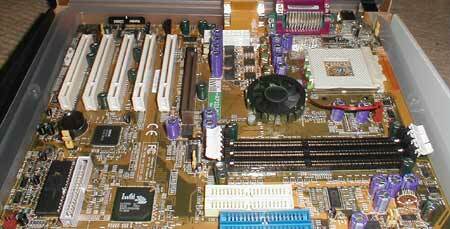 Back then; our ultimate motherboard was to feature the AMD 761 Northbridge because of its unparalleled stability and lack of compatibility issues. Since then, AMD bowed out of the chipset market stating that companies such as VIA and SiS had things covered and that there was no need for the more expensive AMD chipset in the desktop market. There was a huge gasp of disbelief that could be heard across the industry. How could AMD leave the future of the Athlon platform in the hands of motherboard manufacturers that primarily use VIA chipsets? Truth be told; the fact that the Iwill XP333R features an ALi Magik 1 M1647 Northbridge and M1535D+ Southbridge with it's PC2700 support and ATA133 not only refreshing, but also makes this reality in motherboard heaven exceed our dreams! 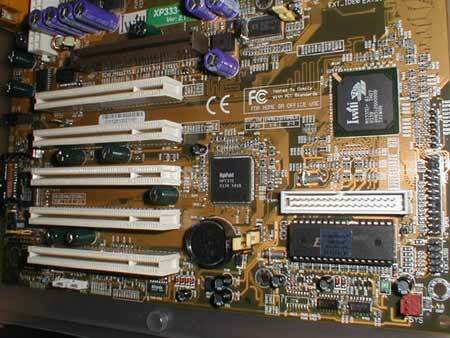 Why the Iwill XP333R may be that perfect motherboard? The XP333R featured everything we wanted and then some. The ALi M1535D+ Southbridge supports ATA133 natively, and in case a RAID array is in order for your rig, or a simple need for an additional pair of ATA133 controllers, the XP333R also features the Highpoint HPT372 controller. The sound is courtesy of C-Media's CMI8738 MX sound chip. It supports 6 channels and is capable of decoding the 5.1 standard, which allows for 5 discrete channels of audio ideal for DVDs. The BIOS is truly the shining star of this awesome line up of specs. It's all on one page called the "Iwill Smart Setting" menu that made me feel like a kind in a candy store. In this menu, one can select the CPU front side bus, the CPU multiplier, the PCI divider and the CPU core voltage. Core voltage could either be selected from a list, or increased by a flat 10% (the quick and dirty, yet effective way). Some day, those who wish to use PC333 asynchronously with a typical 266 MHz FSB CPU will be able to do so and see a performance increase. This is something that Iwill assures me is in the works for the XP333R motherboard, but currently the newest BIOS features the ability to set the RAM at 166 with the CPU FSB still at only 133, but one suffers a performance hit as opposed to a performance increase. This did not concern me all too much as other boards on the market with the same chipset don't even benchmark as high as this one WITHOUT overclocking it! The fact that this board is only going to get better for a larger populous through BIOS revisions should make other motherboard manufacturers shake in their bunny suit boots! The benchmarks proved to be very interesting. The unlocked AMD Athlon Thunderbird 1.33 GHz CPU was run at its default speed (133 X 10) as well as 1411 MHz (166 X 8.5) and 1485 MHz (166 X 9). 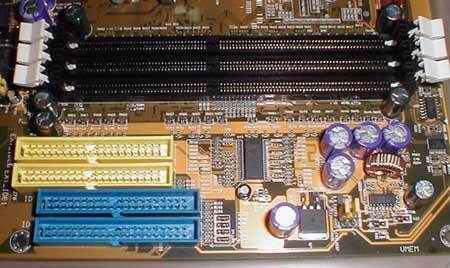 The RAM was a pair of Mushkin PC2700 256MB, for a total of 512MB. 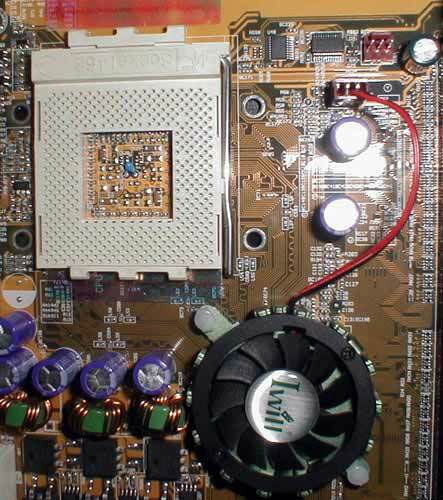 The video card was an Asus GeForce 2 GTS 32MB DDR. The hard drive was a Maxtor ATA133 drive running Windows XP. 3DMark2001 would not run at 1485. This was certainly due to the CPU. Even with the voltage increased by 10% and a Coolermaster Heat Pipe, 3DMark2001 would not run at this speed or beyond. Evolva saw an increase of minimum FPS at 1411 and an increase of maximum FPS at 1485. The bumpmapped benchmark, however, showed a slower average and maximum benchmark with the 166 MHz FSB. We thought that there was actually a very good reason for this. We had thought that at 166 MHz FSB, the AGP was only running at 55.3 MHz as opposed to 66 MHz due to a 1/3 divider instead of a 1/2. Iwill assures me that the AGP divider is 2/5 at 166 MHz FSB. Unfortunately, I could not prove or disprove this. Ordinarily, I would go into SiSoft Sandra and click on "Mainboard Information" and scroll down to "AGP Bus". For some reason, when I tried this on the Iwill XP333R, there was no AGP bus information! I'll just have to take Iwill's word for it about the AGP divider and figure out why the slower benchmarks at 166 MHz at another time. We had thought that perhaps Evolva was just being a crack-head, so we tried Quake 3 Arena. We all had a good laugh over the Q3A benchmarks. After establishing a base with the CPU running at 1333 MHz with it's default 133 MHz FSB, we stepped up to 1411 and we obtained nearly identical scores! Certainly, the GeForce 2 being used is a year shy of being state of the art, so it was speculated that the reason for the Quake results was a bottleneck at the video card. We then tried 1485 MHz and Q3A locked up like 3DMark2001 did. Can I get a collective Homer Simpson style "DOH!"? The Sandra scores are all self-explanatory. The faster the CPU, the better the CPU benchmarks. And of course, the memory benchmarks went up as the memory's front side bus went up. The only time the memory benchmarks did not go up when the memory's bus went up was when we tried to run the RAM's speed asynchronously with the CPU's FSB. But as stated earlier, this is something Iwill is working on and is currently just a flaw in the current BIOS. For this reason, I did not even post the memory benchmarks in this review, as it would be negative press that simply has no bearing on the actual performance of the board. What these benchmarks will be AFTER Iwill fixes the BIOS is something that's worth reporting, and if I remember to do so, I will post an update with the asynchronous scores at that time.